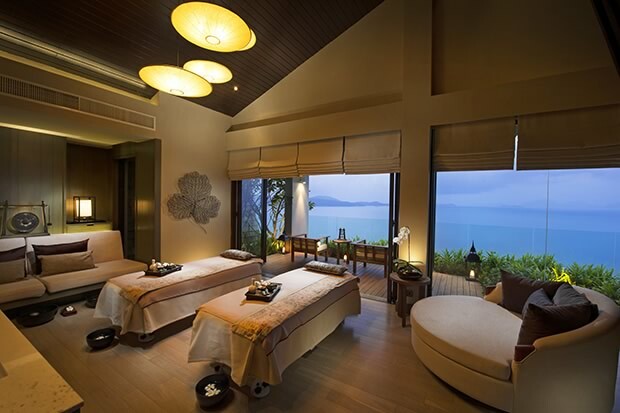 Holistic pampering, luxurious premises make The Spa at Conrad Koh Samui an experience to remember. Start with an “Aromatic Herbal Steam Bath.” Let the herbal compresses free your energy flow in “Herbal Touch.” Apply “Meridian Massage” to release the last remaining chi blockages. Take a break and have a “Spa Cuisine Lunch” and an exceptional dessert: “Fresh Food Facial” with skin-brightening natural ingredients of honey, orange, and cucumber. Finish the healthy retreat with a stimulating “Foot Massage.” These are ingredients for a perfect day at the spa, right? The treatments above, compiled under the “Body Herbal Renewal Retreat” package are just among the many wellness programs that The Spa has to offer. There are more. For example, “Essence of Koh Samui” is an attractive mix incorporating classes at the fully equipped Fitness Center, spa treatments, and healthy cuisine. “Spa Detox Retreat” combines spiritual, therapeutic, dietary, and herbal solutions such as stretchin and acupressure. There is something for the soul, body, and mind. The luxurious premises are an essential part of the holistic experience. The spa has two levels, both boasting 270-degree views of the ocean, seen from the spacious, stylish single and couple treatment rooms. The rooms feature oversized tubs and private decks, while the Royal Suite contains a private plunge pool. Facilities also include Thai massage rooms, a dedicated beauty salon, spa library, and a retail boutique. “Our philosophy is to create unforgettable memory of your luxurious time at The Spa, while still leaving the most important luxury up to you – the Luxury of Being Yourself,” says The Spa´s website. To provide a memorable and customized experience for every guest, The Spa has taken a professional approach by listing the ingredients for successful service. Firstly, every treatment session starts with a detailed consultation, so the individual needs and wishes will translate into a tailor-made service. There is also an option of “Building Your Own Spa Program,” which allows the guests to customize their schedule with a pick of facials, body treatments, and massages collectively for a half day or a full day. Another essential part of the experience is Aromatherapy Associates´ scents and oils, which “soothe and calm the mind, bring the emotions into balance, and ease strains, tension, and blockages in the body and skin.” With the soft murmur of tranquil music, calm and stylish surroundings of the spa, and the world of sensual scents, it is easy to lull into the right track of purifying pleasure. But some exotic whiffs are not enough for an excellent spa treatment. Far more important is the professional care. To ensure the authentic service, Dr. Buathon Thienarrom, a renowned holistic practitioner, provides training for all therapists at The Spa. The comprehensive training includes for example Reiki I, a spiritual practice, which aims to implement integrity, wisdom, and a sense of fun in everything the receivers, as well as the practitioners, do. Mutual wellbeing as the goal of this practice, which might be the most mutually fulfilling experience for hedonists in spa slippers, as well as for spa professionals in this part of the world. 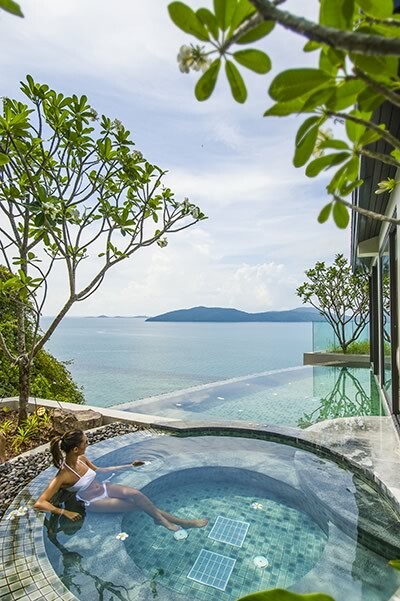 Is it any wonder The Spa at Conrad Koh Samui, has been voted by thousands of discerning spa-goers worldwide as “Continent Winner for the Best Luxury Wellness Spa” at the World Luxury Spa Awards 2013?